New York, the largest of the Middle Atlantic states, is bordered on the east by Vermont, Massachusetts, and Connecticut, on the southeast by the Atlantic Ocean, on the south by Pennsylvania and New Jersey, on the west by Lakes Erie and Ontario and the Canadian province of Ontario, and on the north by the province of Quebec. New York has a total area of 141,089 sq km (54,475 sq mi), of which 18,779 sq km (7,251 sq mi) are inland water. New York’s 1990 resident census population was 17,990,455, up slightly from 17,558,072 in 1980. 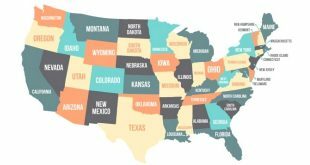 The state is second only to California in population. In 1664 the colony passed from Dutch to British hands and was named New York for the duke of York (later King James II). Almost from its beginnings New York has been known as the Empire State. Until recently it led all other states in population, and it still leads in manufacturing, wholesale trade, communication, and finance. Although New York’s economy is generally healthy, the state has experienced periods of slower economic growth than other parts of the country, of slowing or declining population growth, and of rising costs for social services and education. Political leaders warn of the growing gap between rich and poor. The ADIRONDACK MOUNTAINS, part of the Laurentian Mountain system, in northeastern New York, constitute about a quarter of the state and rise to elevations above 1,500 m (5,000 ft). Mount Marcy, the highest point in the state, has an elevation of 1,629 m (5,344 ft). West of the Adirondacks the Tug Hill Plateau is a tableland of low relief and sluggish streams. Northeast of the Adirondacks the St. Lawrence-Champlain lowland forms a corridor between the Great Lakes and the Atlantic Ocean. The Hudson River originates in the Adirondacks and flows south through its 16-to-32-km-wide (10-to-20-mi) valley. The Taconic Mountains, which lie along the eastern border of the state to the east of the Hudson, reach elevations above 610 m (2,000 ft). South of the Taconics the Manhattan Hills include most of Westchester County and Manhattan Island. West of the Hudson River the Hudson highlands, about 305 m (1,000 ft) in elevation, extend southwest. The Triassic lowland is a wedge of low, rolling terrain just south of the Hudson highlands. Their best-known feature is the PALISADES, sheer cliffs of igneous rock forming the west bank of the Hudson River. The major features west of the Hudson, however, are part of the Appalachian Mountain system, which occupies nearly half the state in the south. The eastern part of this region is known as the CATSKILL MOUNTAINS, a rugged section with elevations reaching about 1,220 m (4,000 ft), with steep, narrow valleys. Slide Mountain, at an elevation of 1,281 m (4,203 ft), is the highest peak. West of the Catskills the land is hilly, the central and lowest portion of the upland consisting of the Finger Lakes Hills, characterized by deep glaciated valleys. Near the extreme southwest corner of the state are the ALLEGHENY MOUNTAINS, the only unglaciated part of the upland. Mean annual precipitation for most of the state is about 889 to 1,143 mm (35 to 45 in). Along Lakes Erie and Ontario are belts of especially heavy snowfall. The Tug Hill Plateau, for example, receives more than 4,445 mm (175 in) of snow each winter–the heaviest snowfall east of the Rocky Mountains. Generally, January mean temperatures in the state are below 0 deg C (32 deg F), except in the New York City area, and July mean temperatures are about 21 deg C (70 deg F). New York has many restored colonial homes and historic sites, among them Sunnyside, the home of Washington Irving, in Tarrytown. Lyndhurst, the 19th-century mansion of Jay Gould, is maintained, also in Tarrytown, by the National Trust for Historic Preservation. The Franklin Delano Roosevelt Historic Site in HYDE PARK is open to the public. The National Baseball Hall of Fame and Museum is in COOPERSTOWN. Fort TICONDEROGA, on the shores of Lake Champlain, has been restored. The major vacation areas are NIAGARA FALLS, the Adirondack and Catskill mountains, the Finger Lakes and Great Lakes, Long Island, and New York City. The Adirondacks are protected under an 1885 law establishing the Forest Preserve, and the state park was established in 1892, covering 23,029 sq km (8,891 sq mi). The Catskill Park, also part of the forest preserve, covers 2,786 sq km (1,075 sq mi) and includes some of the wildest country in the Northeast. The state owns 19 parks in the Finger Lakes region, and Fire Island is part of a National Seashore. New York has several major sports teams, including the New York Giants and Jets, and the Buffalo Bills (football); the New York Cosmos (soccer); the New York Yankees and Mets (baseball); the New York Knickerbockers (basketball); and the New York Rangers, Islanders, and the Buffalo Sabres (hockey). Tourism and recreation contribute much to the state’s economy. Multitudes visit New York City, but many millions of tourists are attracted annually by the numerous state parks, campgrounds, and historical sites elsewhere in the state. Privately operated recreation centers, both summer and winter, draw many more. Two Indian groups occupied what is now New York State when Europeans began exploration and settlement. ALGONQUINS, composed of several tribes, occupied much of the Hudson Valley, Manhattan, and Long Island, while the Iroquois controlled most of the rest of the state area. About 1570 the Iroquois formed the IROQUOIS LEAGUE, consisting of the CAYUGA, MOHAWK, ONEIDA, ONONDAGA, and SENECA tribes. The league dominated or conquered many other tribes in the region. In 1722 the TUSCARORA were added to the confederation. This era began with the exploration of the Hudson River; Giovanni da VERRAZANO is believed to have sailed into New York Bay in 1524. In 1609, Henry HUDSON sailed as far as present-day Albany in the service of the Dutch. The first settlement was Fort Nassau (1614-18) at present-day Albany. In 1621 the DUTCH WEST INDIA COMPANY was chartered and empowered to establish the colony of NEW NETHERLAND. Between 1624 and 1626 a series of Dutch forts were established along the Hudson, from Fort Amsterdam on Manhattan to Fort Orange (replacing Fort Nassau) at Albany. Dutch settlement was slow, however, in part because of the land-granting system of patroonships (see PATROONS). Originating in 1629, patroonships were land grants of approximately 25 km (16 mi) along one side of the Hudson River or about 13 km (8 mi) on both banks and reaching an unspecified distance away from the river. The system was fraught with difficulties because it relied on tenant farming rather than outright land grants to settlers. In 1664 the British sent a fleet to New York Harbor, and Peter STUYVESANT, the Dutch governor, surrendered the colony to the British, who renamed it New York after the duke of York. The colony saw important territorial changes under British rule. In 1664, New Jersey was separated from the rest of the colony. The boundary between New York and Connecticut was established basically as it exists today in 1665. In 1688, New York and New Jersey were combined with the New England colonies in the Dominion of New England under Sir Edmund ANDROS. News of the Glorious Revolution in England and the overthrow of Andros in Boston encouraged a rebellion in New York led by Jacob LEISLER. He won control and ruled the colony for 2 years (1689-91) before royal authority was restored. In the aftermath of the rebellion the crown established (1691) a legislative assembly, which assumed increasing responsibility in the following decades. New York was a pivotal colony during the FRENCH AND INDIAN WARS, which were fought for control of North American trade and territory. New York’s location near Canada exposed the colony to French attack, and British armies launched attacks on Montreal and Quebec from Albany. A series of wars with intermittent periods of peace culminated in the final defeat of the French in 1761, establishing British control over what is now New York State. Settlers from New England then began to drift westward into New York, and the population began to rise. New York also occupied a strategic position during the American Revolution. About a third of the major battles were fought in the state. To thwart the British drive for control of New York City, Gen. George WASHINGTON tried unsuccessfully in August 1776 to defend it against superior British forces led by Sir William HOWE. A series of battles lasted 3 months, and then the conflict shifted to New Jersey and Pennsylvania. The British drive along the Mohawk was thwarted by their defeat at the Battle of Oriskany, near Fort Stanwix (present-day Rome), in August 1777. In July 1777 the British general John BURGOYNE captured CROWN POINT, Ticonderoga, and Fort Edward. In October the Americans and British met in a decisive battle at Bemis Heights near Saratoga, where Burgoyne was forced to surrender (see SARATOGA, BATTLES OF). During the Revolution a constitution was adopted in April 1777, creating New York State with its temporary capital at Kingston. In 1797, Albany became the permanent capital. Alexander HAMILTON and John JAY, leaders of the New York delegation to the Constitutional Convention, were strong supporters of adoption of the federal Constitution. A bitter contest developed within the state on this issue, but eventually New York became the 11th of the 13 original states to ratify the new constitution on July 26, 1788. By the end of the first quarter of the 19th century New York had millions of acres of land cleared and was exporting agricultural goods; manufacturing flourished; and New York City had become a leading trade and industrial center. Part of this growth resulted from the expansion of transportation facilities. In addition to the natural waterways, a system of turnpikes spread across the state. The ERIE CANAL, linking the Hudson River with Lake Erie, was completed in 1825. The first railway opened (1831) between Albany and Schenectady, and within another 25 years most parts of the state were linked by rail. Robert FULTON’s first successful steamboat appeared on the Hudson River in 1807. By 1820, New York led all other states in population, and by 1850 it was the leading manufacturing state. A democratization of New York society took place during the 1830s and ’40s; suffrage was extended and, after the bitter ANTIRENT WAR, tenant farmers were given the opportunity to own the land they farmed. Slavery was abolished and women’s rights, temperance, and educational and prison reform were pursued. Many of the nation’s leaders arose in New York at this time, among them De Witt Clinton (see CLINTON family), Martin VAN BUREN, and William H. SEWARD. Horace GREELEY, another notable New Yorker, was among the leaders of the antislavery movement as the country moved toward the Civil War. During the war 500,000 New Yorkers fought, and 50,000 of them were killed. After the war, economic development in New York proceeded at a rapid pace; corporations grew larger and giant trusts appeared. Urbanization was also rapid, with huge numbers of immigrants from Europe pouring into the state. Along with these developments came such social ills as corporate malpractice, political corruption, unjust labor conditions, and inadequate social services. Into this situation stepped the political institution known as TAMMANY HALL. In the 1780s a largely middle-class group was formed to combat the aristocratic Revolutionary leaders. By the mid-19th century the group was firmly in the hands of Irish politicians who dominated New York City politics, culminating in the control of the Democratic machine after 1868 by William Marcy TWEED. Republican control of upstate politics intensified the conflict, and such nationally prominent New Yorkers as Samuel J. TILDEN, Grover CLEVELAND, Theodore ROOSEVELT, Franklin D. ROOSEVELT, and Charles Evans HUGHES fought for reform of this machine. Investigations, such as the Seabury Commission (1931-32), and the mayoral administration of Fiorello H. LA GUARDIA (1934-45) in New York City saw the eventual curtailment of Tammany Hall power. Since World War II the gap between New York City and the upstate region has not closed. The city, with a gross economic product larger than all but a few nations, remains the focus of much of the economic, financial, and cultural life of the nation. The deepening financial woes of the nation’s cities, with eroding tax bases and increasing needs for social services, make it likely that the state and New York City will become more closely linked. In spite of this trend, the traditionally liberal Democratic city and the traditionally conservative Republican upstate will probably remain in conflict in many areas. Concern for the environment intensified during the 1960s as two Pure Waters Bond Acts were approved. Later, other programs made possible the acquisition of more forest wetlands, urban parks, and other ecologically or recreationally valuable areas and provided funding for the cleaning up of hazardous waste sites. Despite a decreased pace of population and industrial growth, the state has continued to produce some leaders of national stature. Former Gov. Nelson ROCKEFELLER, who ran three times unsuccessfully for the Republican nomination for the presidency, was appointed vice-president in 1974. In 1984 Geraldine FERRARO, a U. S. representative from Queens, was the Democratic vice-presidential candidate, and during the late 1980s and into the new decade Gov. Mario CUOMO was a leading spokesman of the Democratic party. Area: 141,089 sq km (54,475 sq mi); rank: 27th. Capital: Albany (1990 pop., 101,082). Largest city: New York City (1990 pop., 7,322,564). Elevations: highest–1,629 m (5,344 ft), Mount Marcy; lowest–sea level, at the Atlantic coast. July 26, 1788; the 11th state.